As a USF alumnus, I've always felt a certain kinship with the University of Houston. This may sound like convenient, revisionist history, but let me explain. Over a decade ago, when preparing to graduate from grad school at USF, Houston was a school (among many others) I considered, and interviewed with at a conference. When doing my research, quite a few things stood out to me. Geographically, both UH and USF are large schools in major metropolitan areas that sit a bay away from the Gulf of Mexico. Each is a multi-campus system with a Research 1 main campus. Their home states are the second- and third-largest in the US, by population. Both states are unequivocally considered football powerhouses. Both schools sit in the next tier of state schools with a pair of vaunted state football programs and a heavy hitting private school or two. We were conferencemates in Conference USA, and are once again in the American. As the Big 12 once again kicks the tires on realignment, there's another commonality in which I'm interested: Leadership. Long considered a longshot because of Big 12 saturation in the state already, the University of Houston is emerging as a frontrunner, with support coming most notably from Austin - both the state house and the flagship university (and Big 12 800 pound gorilla) located there. How does this relate to USF? Houston's president, Dr. Renu Khator cut her academic teeth at USF, spending 22 years there before taking her current post at Houston. During my time at USF, Dr. Khator became the interim and ultimately permanent provost and senior vice president, and while serving in the role, helped USF into its previous major conference step up: The move to the Big East in 2005. It's reasonable - likely, even - to assume that she played a big role in ushering in the change and in doing so, she worked alongside USF's then- and current president, Dr. Judy Genshaft. While I don't know what their relationship is, I would imagine that anything other than abject bad blood would leave Khator with a favorable impression of her former school and her presidential colleague. Every step of realignment to date has shown that it's far less about things like academic ranking and university prestige and more about media markets and network dollars. Still, USF stacks favorably on all of these metrics, and having a friendly face after the same goal can't hurt. Ultimately, university presidents cast the votes, and while it's true that Houston isn't yet in and thus doesn't have an official vote or voice, I would imagine that if they're a serious candidate, their opinion may be valued. While the academic portion is often lip service in realignment, it's worth noting that USF was recently designated an "emerging preeminent" within the state of Florida, continuing to carry the baton passed by Khator in her days as chief academic officer. While USF hasn't been engaged in the open lobbying some other potential candidates have been, those in the know will note that real Gs move in silence, and leveraging such a relationship would certainly be a strong behind-the-scenes move. My read? 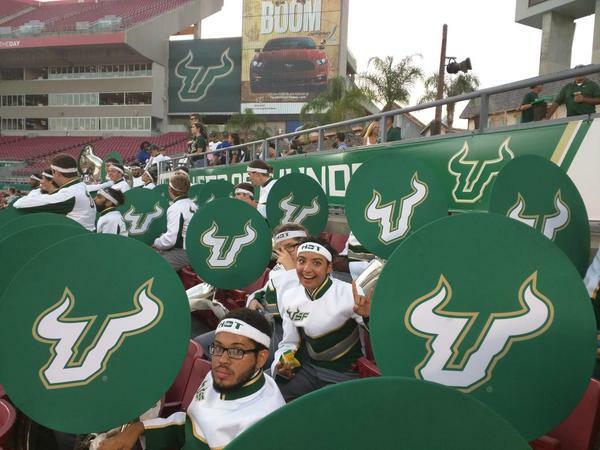 If we're truly cranking the realignment wheel once again, USF's fate remains intertwined with Central Florida's. If the Big 12 expands to 12, there's a good chance that USF gets left out in the cold, pairing UH for a top independent in BYU or a closer-to-the-footprint Memphis or Cincinnati. If they go to 14 - where currently, every other Power 5 league except the Pac-12 sits - I think USF and C. Florida get the call.